is a Senior Principal Research Scientist with Data61, CSIRO. Commonwealth Science Industrial Research Organisation (CSIRO) is Australia’s national research agency. Arkady is leading Data61 R&D projects in Internet of Things, mobile analytics and context-awareness science areas. He is a technical leader of the EU Horizon-2020 project bIoTope – building IoT Open Innovation Ecosystem for connected smart objects. Professor Arkady Zaslavsky holds Adjunct-Professorship appointments with a number of Australian and International universities, including UNSW, La Trobe University, University of Luxembourg and ITMO University, StPetersburg. Arkady Zaslavsky has published more than 400 research publications throughout his professional career and supervised to completion more than 35 PhD students. 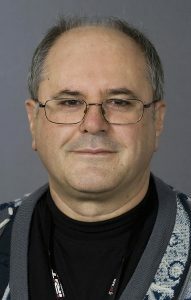 Arkady Zaslavsky is a Senior Member of ACM, a Senior Member of IEEE Computer and Communication Societies. More information CSIRO Profile | Google Scholar | LinkedIn | ORCID. Real-time decision support in smart cities: will IoT and global awareness help? Smart cities are an emerging paradigm which is characterized by high diversity of applications, interoperability challenges, policy issues, data availability, big data and data access openness, challenges of deploying IoT infrastructure, diverse and heterogeneous data sources, cross-domain analytics and many other challenges. Real-time decision support for various stakeholders in smart cities is a critical challenge that can be only addressed by collective R&D effort from many disciplines of computer science, business and information systems. Among enabling technologies for smart cities is the Internet of Things (IoT) which is one of the major disruptive ICT technologies. IoT will connect billions of “things”, where things include computers, smartphones, sensors, actuators, instruments, robots, objects from everyday life. IoT will be the main source of big data according to predictions of many experts. This talk focuses on myths and challenges of smart cities and the IoT. IoT big data underpins the ability to develop a notion of IoT ecosystem-wide awareness of everything that happens, happened or might happen within the system realm, whether these are processes, events, activities, locations, preferences related to human users as well as all of the components of a cyber-physical system (CPS) in question. We term this awareness as “IoT-enabled awareness” i.e. the ability of the system, application and/or service to be globally-aware, including context-aware, situation-aware, event-aware, human-aware, location-aware, process-aware, and so on and so forth. The talk will also showcase a CSIRO IoT platform “Context-as-a-Service” (CoaaS) which is being developed as part of EU Horizon-2020 project biotope. Examples of using CoaaS in various use cases, including intelligent transportation systems and smart waste management, will be also demonstrated. Marko Debeljak is a senior Research Fellow at the Department of Knowledge Technologies, “Jožef Stefan” Institute, Slovenia. His research goals are applications of advanced decision analysis in environmental sciences, in particular to agriculture in order to improve the quality of scientific and management decisions that would facilitate sustainable management of natural renewable resources and production of healthy food. His approach is based on development of qualitative multi-attribute decision models induced by DEXi modelling tool that he applies in several agronomic domains. This includes topics concerning the adverse effects of genetically modified crops on the environment, the impacts of various agronomic practices on soil quality, traceability of agronomic products through the quality chains, environmental assessment of pesticide use and assessment of sustainable farming systems. His approach facilitates transdisciplinary and multi-actor collaboration of experts involved in the decision process and provides flexible decision support to decisions makers and decision users. The application of pesticides in agriculture is not always safe for human health and the environment. Despite being officially approved by authorities in terms of ecological risk, they appear in surface and ground water in concentrations above the official thresholds. Due to the existing problems with water pollution with pesticides, the improvement of post-authorisation and post-market environmental risk assessment and management of pesticides is needed. To address this challenge, we used a decision making approach that is based on i) a combination of expert knowledge about the application of different crop and soil management practices for the reduction and elimination of water pollution with pesticides, ii) data about meteorological conditions and soil properties of the crop protection plans for specific field conditions, and iii) management constraints of the farmers (e.g., availability of field infrastructure elements, such as buffer strips, fascines, soil drainage system, etc.). Developed decision support system (DSS) comprising risk assessment and risk management modules. The first module evaluates the risk of the application of the proposed application of pesticides for the pollution of ground and surface water with pesticides. The second module explores the possibilities for the reduction of the pollution risk, if it was recognized in the first module, and outputs a list of mitigation measures applicable at the field level to alleviate the risk (risk management module) of water pollution with pesticides. To develop a DSS we used a Multi Criteria Decision Analysis implemented into the DEX (Decision EXpert) integrative methodology of building qualitative multi-attribute decision models by the DEXi modelling tool. The DSS system for environmental safe use of pesticides is developed for the arable land area of the entire continental France and is designed for the application at the field level. The validation of the developed DSS system was performed on data from the experimental site La Jaillière (a reference site for the European Commission FOCUS working group), guidelines for best management practices for prevention of water pollution with pesticides disseminated by the TOPPS – EU Life project and expertise about sustainable used of pesticides provided by the ARVALIS, Institut du végétal, France. DSS is implemented in a web-based application available to end-users.